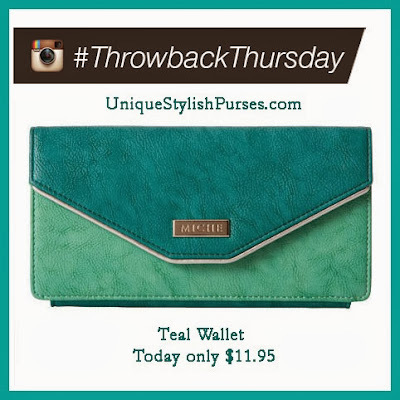 Purchase this Teal Wallet for only $11.95 until Friday 10/4/13 at 8 AM Mountain ONLY while supplies last! This delectable wallet is so pretty it will make you smile every time you pull it out of your Miche Bag! Teal textured faux leather features mint detail and glossy pale pink piping. Magnetic exterior closure. Interior is mint faux leather with dark green and polka dot fabric accent. ID card and four credit card slots; open bills pocket and zippered lip gloss and small item compartment. Exterior zippered rear pocket for change. Dimensions: 8” long x 4 ¼” wide.